Secretin stimulation test is a test that measures the ability of the pancreas to respond to secretin. Secretin is a hormone secreted by the small intestines in the presence of partially digested food from the stomach; this hormone normally stimulates the pancreas to secrete a fluid with a high concentration of bicarbonate. This fluid neutralizes the acidity from the stomach that is necessary for a number of enzymes to function in the breakdown and absorption of food. 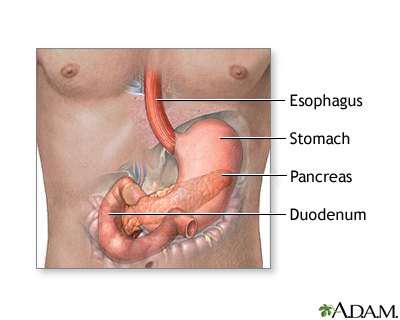 In order to perform the test a tube is passed through the nose into the stomach then into the duodenum. Secretin is administered and the contents of the duodenal secretions are aspirated and analyzed over a period of about 2 hours. People with diseases involving the pancreas, such as chronic pancreatitis, cystic fibrosis, or pancreatic cancer, may have abnormal pancreatic function.